My Life with Evie and William: Crazy AppleCheeks October! Soooooo October is going to be abso-frickin-lutely amazing! 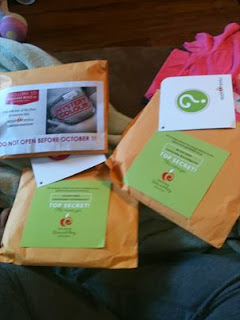 There is tons going on in the AppleCheeks world and you don't want to miss any of it! So right off the bat, October 1st, Snuggle Bugz is releasing their exclusive new colour. I have sniffed and poked and attempted to x-ray the package, but I still have no idea what colour it is! My guesses though are: kelly green, purple, pink, grey or light yellow. What do you think it will be? Next on October 4th the Ultimate Unicorn videos are due. This is a huge and wonderful contest. There are only going to be 6 (3 of each size) of this un-copyable diaper ever made! This is THE only way to get one, and I of course am desperate to have one! *Spoiler Alert* my video is going to be Epic, possibly worthy of a trilogy and then a fourth added 20 years later ;) ! We should finish up filming tomorrow and I promise that my blog followers will get to see it first! Keep watch over the next few days for the exclusive preview. Then to top out the first week of October prepare yourself for the epic Midnight release party! AppleCheeks is bringing a replacement for Dark Chocolate to their permanent line-up. In my experience the marketing for these parties is a huge give-away for the colour, so I am hedging my bets towards a grey or a return of black. Also, don't forget your costume and dress up as your favorite AppleCheeks character! Luckily my Halloween costume is a perfect fit already! So if you feel like playing with all your crazy friends at midnight (1 am here!) in costume, this is the time and place to do it! Lastly on October 16th there will be one final release. Live from ABC kids expo, our favorite diaper ladies will reveal the new limited edition diaper! My guess for this one are basically the same as the Snuggle Bugz release, though I am leaning more towards a girly colour as this would be a perfect opportunity. So if you are already riding high on a wave of AppleCheeks love, this month is sure to send you over the top!